The last passenger service on the railway through the Creston Valley. The last run of the last steamship on Kootenay Lake. The last telephone party line. The last performance of the Carpe Diem theatre group. The last Afternoon Tea at the Creston Museum. 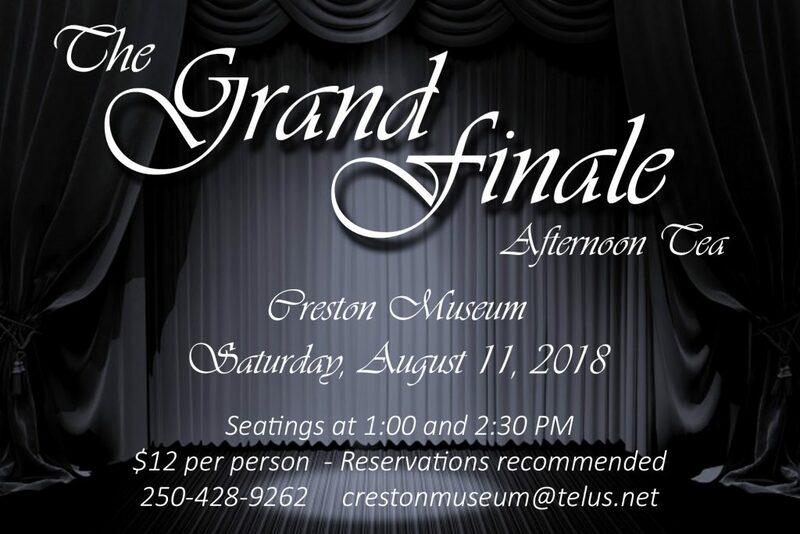 Yes, that’s right – after twenty years, the curtain is falling on the Creston Museum’s annual Afternoon Tea. Join us as we celebrate this and other historic “lasts” in the Creston Valley. Saturday, August 11, 2018. Seatings at 1:00 and 2:30. 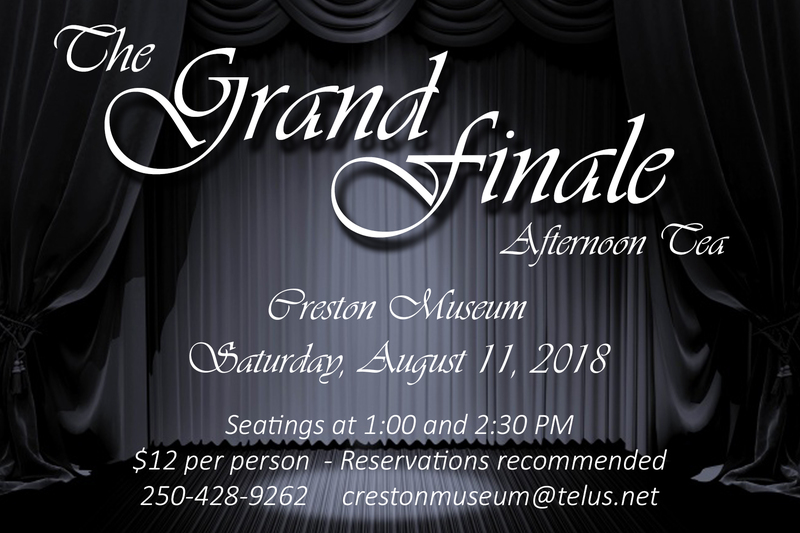 Reservations are highly recommended: call 250-428-9262, email crestonmuseum@telus.net, or buy tickets online below. $12 per person ($10 per person for members). 1:00 PM – One table for four available. 2:30 PM: Three tables for four and one table for eight available, plus a couple seats here and there. Interested in coming in costume? or get creative and come dressed to represent a “Last” in Local History! The last voyage of the sternwheeler SS Ainsworth was on November 29, 1898 – she sank in a storm on Kootenay Lake en route from Nelson to Creston. The last local casualty of the First World War was Russell Leamy, who died in 1929 as a direct result of wounds to the chest he received in France. The last day of operations for the original electrical power plant in Creston, located on Victoria Avenue (now 10th Avenue North), was December 31, 1933; the following afternoon, the power dam on Goat River in Canyon went into operation. The last (and first, for that matter) time the Harlem Globetrotters played in Creston was December 31, 1938 – though there have been several visits since from the Harlem Clowns and similar spin-off groups. The last class to graduate from Creston Valley Junior-Senior High School (present-day Adam Robertson Elementary School) did so on June 27, 1951. The last day on which a siren signaled the curfew was January 13, 1956; from then on, a siren sounding in Creston would mean fire – the direct result of recommendations made by Acting Fire Marshal G.A. Alderson after the fire that destroyed the Crawford Block on Canyon Street on the previous New Year’s Eve. The last run of the SS Moyie, the last sternwheeler operating on Kootenay Lake (or anywhere else in North America, for that matter), took place in April 1957. The last day of operations for the local telephone switchboard office was in 1957; after that, everyone enjoyed direct dial telephone service. The last show at the Grand Theatre was “The Man from Colorado,” which ran September 29-October 1, 1960. The last passenger service on the CPR trains through the Creston Valley was in 1964. The last event held in the old Civic Centre before it burned was a Hallowe’en bonspiel hosted by the Creston Curling Club over the weekend of October 31-November 3, 1968. The last time Creston won a division title in the KIJHL was in 1977-1978; however, the Creston Clippers were defeated by the Castlegar rebels for the League championship. The last year that the downtown grain elevators operated as public grain handlers was in 1982; by then, only the Alberta Wheat Pool elevator was still opened, the United grain growers elevator having been shut down in 1971. The last run of the West Creston ferry was made on October 31, 1973. The last full performance of Carpe Diem theatre group (that I could find) was “A Midsummer Night’s Dream,” presented in 1999, though they did take part in InterArt 2000 in the summer of 2000 with a series of short skits. The last class at Wynndel Elementary School was held in June 2008.